The Fourth of July is a colorful holiday, where we bring red, white and blue into all kinds of decorations for cookouts, picnics and other parties. I love incorporating colors into my desserts, and the Fourth of July is no exception. I often reach for red and blue food coloring, however I will opt for all natural coloring options – such as fresh or freeze dried berries – when I can. 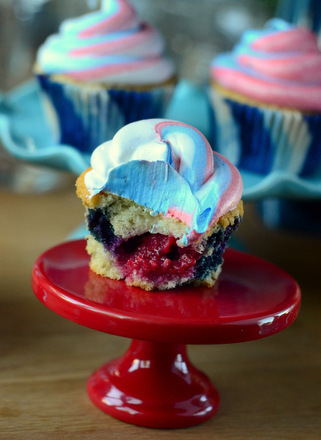 These Red, White and Blueberry Cupcakes are vanilla cupcakes that are studded with raspberries and blueberries, then topped with a swirl of red, white and blue icing. They’re a great choice for summer entertaining because of the fresh berries, but they really are perfect for an Independence Day celebration. The cupcakes start with a vanilla and buttermilk cake batter. 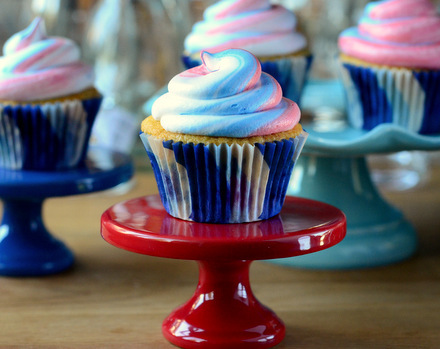 I stirred in whole, fresh raspberries and blueberries, which gave the cupcakes a great burst of berry flavor and a fun red, white and blue color scheme. The cakes have a soft, tender crumb, but they are sturdy enough to support the weight of the berries without letting them all sink to the bottom during baking. The cupcakes remind me slightly of fruit cobbler, since the berries bring so much flavor into each bite. To be honest, the cupcakes are delicious on their own without any frosting, so you could easily omit the colorful frosting that I finished these off with and serve the cakes as-is for brunch. I used one of my favorite recipes for easy icing: Two Ingredient Cream Cheese Frosting. The creamy frosting has a slight tanginess and is a very nice contrast to the cake and berries. I decided to add even more red and blue to the frosting by adding some swirls of food coloring, so I made a double batch of frosting to ensure I would have plenty on hand. If you don’t want to add in food coloring, you could leave the frosting white and garnish the cupcakes by placing a few fresh berries on top of each one before serving. Add half of the flour mixture to the butter mixture and stir until almost combined. Add buttermilk and stir, again, until almost combined. Add the rest of the flour and stir until all ingredients are mixed in. Fold in raspberries and blueberries. Bake for 18-20 minutes at 350F, until a toothpick inserted into the center of a cupcake comes out clean and the cake springs back when lightly pressed. Let cupcakes cool for 10 minutes and then transfer them to a wire rack to cool completely before frosting. Frost with frosting of choice. 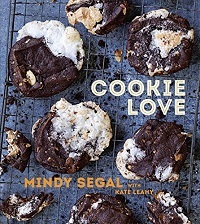 I recommend my Two Ingredient Cream Cheese Frosting. To create the swirl in the frosting:Â Divide the frosting into thirds. 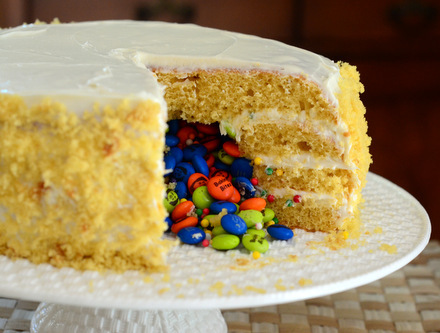 Add red food coloring to one portion of the frosting, and add blue food coloring to another portion. Fit a pastry bag with a large round tip. Add equal parts of red, white and blue frosting to the pastry bag, then squeeze a little out you start to see the three colors all come out together. Swirl the frosting on top of the cupcakes.